In the mood for a refreshing ice cream? Order a classic sundae, a thick shake, or a waffle cone from a Baskin-Robbins restaurant near you. 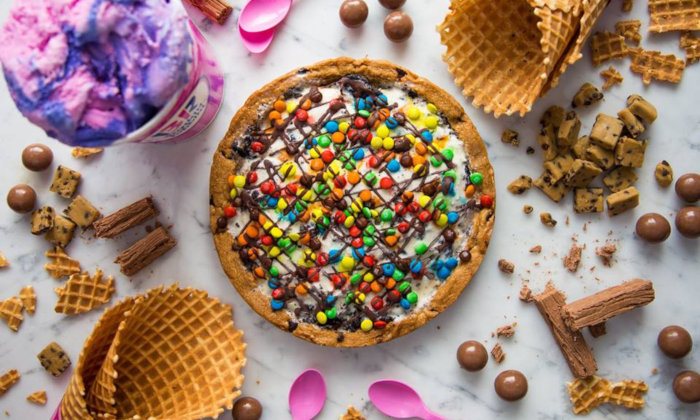 Get Baskin-Robbins delivered to your door! Founded in 1945 by brothers-in-law Burt Baskin and Irv Robbins, Baskin-Robbins is now the biggest chain of ice cream stores in the world! Famous for its original "31 Flavours" slogan, the restaurant has introduced more than 1,300 flavours to its international menus, with each country featuring its own unique offering. The top 5 selling Baskin-Robbins ice cream flavors are....vanilla, chocolate, mint chocolate chip, pralines 'n cream and, of course, chocolate chip. The restaurant also lays claim to more than a few famous former store employees, including Rosie O'Donnell, Julia Roberts, Yankees pitcher Phil Hughes, and even President Barack Obama! Humble beginnings, huh?! In the mood for a creamy treat delivered right to your door? Well friends, Menulog's got your back. Choose from a huge range of delightfully delectable dessert options, like freshly baked waffle cones, hot choc brownie sundaes, and mint choc chip milkshakes. Or maybe you're in the mood for a retro throwback, like a banana split? Whether you need to feed one (or four) hungry little hooligans, or you're hankering for a cool, refreshing summer treat, or you need a birthday cake quick smart (we've all been there), order quickly and easily using Menulog and we'll get you that sugary goodness before you can say "get in my belly"! Log onto the Menulog app or website and within a few taps your classic ice cream treat could be delivered right to your doorstep!